The Essex Street area in Birmingham. BRITISH POLICE HAVE launched a murder investigation after an Irishman this week died from injuries he sustained in a suspected assault last month. 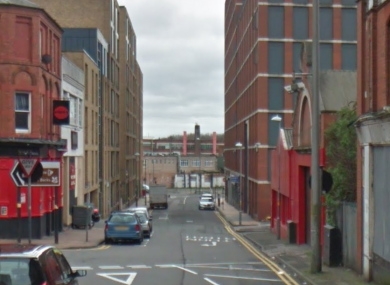 The man, named by West Midlands Police as Phillip Leonard (34) from Louth, was discovered with serious head wounds in the Essex Street area of Birmingham at around 1.30am on 28 July. The 34 year-old was taken to hospital but died on Monday. A post-mortem revealed he died as a result of his head injuries. Police say that another Irishman, Daniel Fitzpatrick (26), was arrested and charged with wounding last month. He is currently remanded in custody. Officers are appealing for information and want to hear from anyone who was in the area at the time. Detective Inspector Ian Iliffe, from West Midlands Police CID, said: “Following the sad death of Phillip this is now a murder investigation. “His injuries were consistent with being attacked and we are keen to speak to anyone who may have seen what happened in the early hours of July 28. Email “Murder investigation launched after Irishman dies in Birmingham”. Feedback on “Murder investigation launched after Irishman dies in Birmingham”.